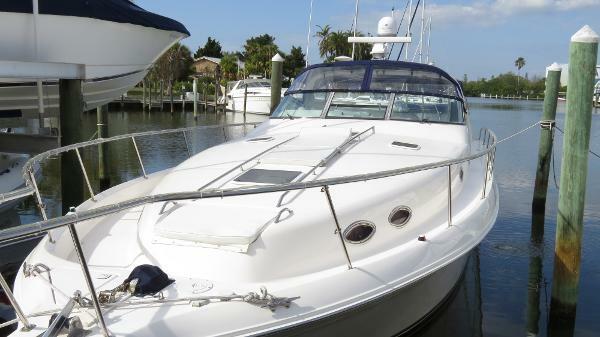 2003 Sea Ray 45 Express Bridge Call Today to see this Beautiful Condition 45 Express Bridge with 2 Staterooms 2 Heads. Only 2nd owner since 2004!! Well maintained with recent service in 3/2016 and with only 675 hours on Upgraded Cummins 480E's. 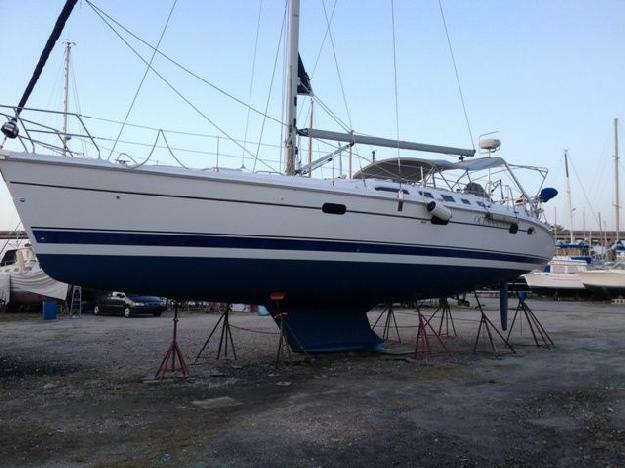 This boat presents a unique opportunity for even the most discerning buyer!!! 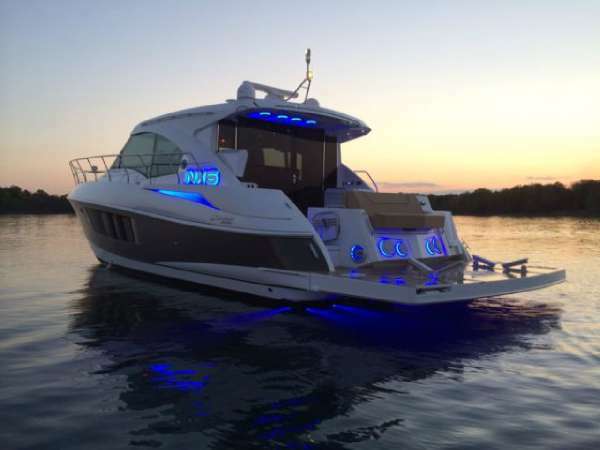 Expansive bridge boasts excellent helm position, wet bar with ice maker, full compliment of electronics, wraparound lounge seating, Bridge isinglass enclosure replaced in 3/2016 with U-zips and walk-through to foredeck are just some of the amenities available for the owner. Huge cockpit with twin transom doors, awning over salon door, and large swim platform. Fishing Support Includes Transom Fish Box and Live-well. Well appointed full-beam salon with cherrywood accents and custom décor including upgraded interior package and more will make for comfortable living. Mid-berth with day head access and private. Private stateroom forward with own head/stall shower. Elevated berth with storage under, hanging lockers, and own AC/heat controls provide the ultimate in comfort. many standard features including these options and more: 2003 SEA RAY 450EBCUMMINS 480CE 46266439CUMMINS 480CE 46266440Tan Canvas/Black & Gold StripingBlossom Cherry FinishBuff Ultraleather Salon Sofa'sT-480EC Cummins V-Drives (T-446 PHP)Dash CoverAutopilot - ST 7001Generator With Sound Box - 544 HoursLive Baitwell SystemMacerator w/Seacock Interlock SysteCockpit Refrigerator (In Lieu of Standard Icemaker)Rod Holders (2)Aft Bench Seating w/Removable StorageCentral Vacuum SystemWasher/Dryer Combo With Int B-Mineral-Sea Oyster Perlino Verde Avonite CountertopsBow ThrusterSea Ray Navigator 10.4" Plotter - InoperableRadar - RL80C w/Open Array RadarHD Salon Flat Screen TV w/VCR/DVD Call John Cernuska for details and schedule appointment. Offered by owner. Professionally yard maintained and fully serviced. No expense spared. 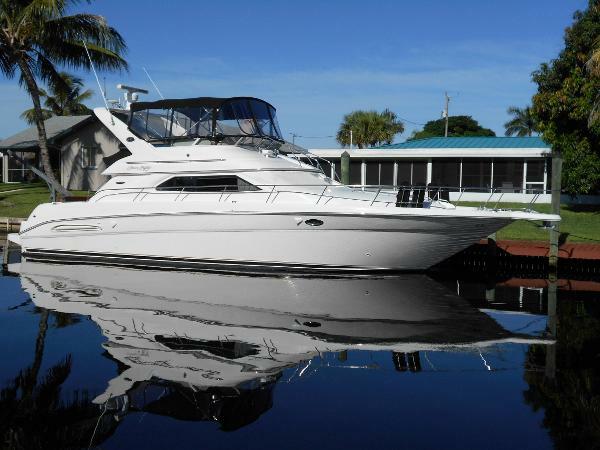 This lightly used 2006 45 Sea Ray is extremely clean and she comes with twin Cummins 500 QSC's with only 465 hours on the motors and 270 hours on the Onan genset. Hull is pewter gray. One must board this Sea Ray Sedan Bridge in order to appreciate her condition. 10,000 lb stainless steel Davit hoist system with 8ft Zodiac,and 6HP new motor. Options include: Washer/Dryer, Central Vacum, Sunpad, Please see "Full Specs" for complete list of options. Please call owner Frank at 604-240-6163. Boat is in Vancouver, British Columbia, Canada. 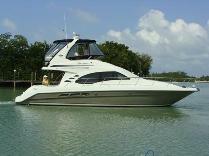 Sea Ray 450 Sundancer. ONE OF THE NICEST 1999 SEA RAY 450 SUNDANCER'S AVAILABLE, PRIDE OF OWNERSHIP SHOWS THROUGHOUT -- PLEASE SEE FULL SPECS FOR COMPLETE ..... this vessel features repowered Twin 450-HP 6CTA'S Cummins Diesel Engine's with only 50 original hours! Notable features include but are not limited to the following: Air-Conditioning & Heat (2-Zones), (2) Head's (Vacuflush) w/Vanity/Sink/Shower (Note Stall-Shower in Forward Head), Cherry Wood / Vitracore Interior Package, Central Vac, Canvas Carpet Runners, Cummins 9.0kw Generator (75-hrs. 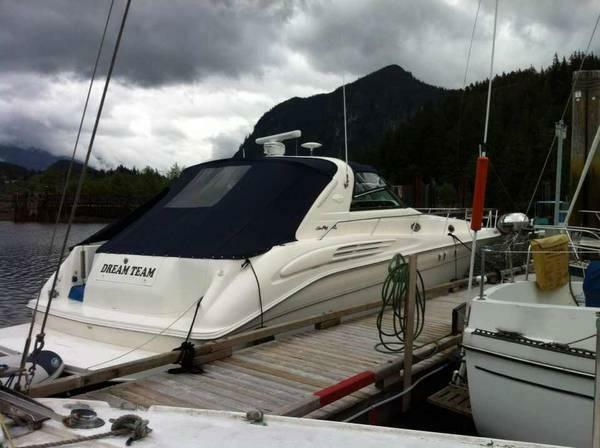 ), Windlass Anchor w/Forward Pedal Controls, Up graded Raymarine digital NAV System E90 Display's w/Radar/GPS/Chartplotter, Newer Factory blue Stamoid Canvas w/Full Enclosure, Fresh Bottom paint w/Interlux paint and much more. Note Fresh Canvas (blue Stamoid), Updated Raymarine NAV Equipment.The Powerboat Guide had this to say: Mega-size sportyacht from 1990s showcased Sea Ray's evolving design, engineering capabilities. Enormous two-stateroom, two-head interior--updated in 1998--features home-size galley, huge head compartments, generous storage. Enormous cockpit with circular aft seating includes double companion seat, superb helm position. Note spacious engine-room, extended swim platform, transom storage locker. Repowered with 450hp Cummins cruise at 24-25 knots (about 30 knots top). Professionally maintained. . .. Please note that the Sea Ray is located in Vancouver BC. Type of Boat: Flybridge Motor Yacht Year: 2000 Make: Sea Ray Model: 450 Express Bridge Length: 45 Hours: 1200 Fuel Capacity: 400 Fuel Type: Diesel Engine Model: Twin 430hp Cummins 6CTA 8.3M Sleeps how many: 6 Number of A/C Units: 3 Max Speed (Boat): 26 Cruising Speed (Boat): 21 Inboard / Outboard (Boat): Single Total Horse Power: 860 Holding: 60 Water: 100 Beam (Boat): 14.8 Draft (Boat): 3.5 Hull Material (Boat): fiberglass Trailer: no Price: 199000 693092 - Excellent condition yacht, all the standard features of the Sea Ray 450 Express Bridge, plus the added upgrades: UPDATES: Bottom paint – Antifouling paint job to reduce marine growth $6000, Custom Fishing Rod holders $12,000 see photos, Underwater Fishing Lights. Electronics: Garmin 7212 & Radar (2)$10,000, Garmin Radio Scanner G2 Vision $1500, VHF: ICOM M504 with Shakespeare Antenna $1000, XM Satellite & DirecTV equipped. New bow Thruster 2010. Interior: Hardwood Floors installed throughout 2012 $10,000, New Fridge & Freezer 2012 $1,000, The boat has 3 total AC units, 2 of which were upgraded in 2012. Master stateroom is forward with large offset berth, built-in TV cabinet ready for flat screen TV, Vacu-flush head with enlosed shower. Hanging lockers to port and stbd. Just aft and to stbd. is the VIP Stateroom with double berth, vacu-flush head and enclosed shower, built-in Panasonic TV, hanging locker and plenty of storage. Up a step to the main salon with galley to port with b'fast bar and swing out stools. A raised circular dinette is to stbd. Large built-in storage locker is aft to port. High quality - high output stereo sound system plus 4 amplifiers powering an extensive exterior speaker system. 3rd stateroom is to stbd under the raised dinette with privacy door, built-in washer/dryer. The aft deck has seating across the stern and fishing capabilities with fish box and livewell. The flybridge has seating for a small crowd, a cocktail table, ice maker, wet bar and it has a walk-thru windshield that leads to the foredeck. Bellini has a cherrywood interior and custom synthetic teak cabin sole throughout. Call Wayne 813-677-7101. 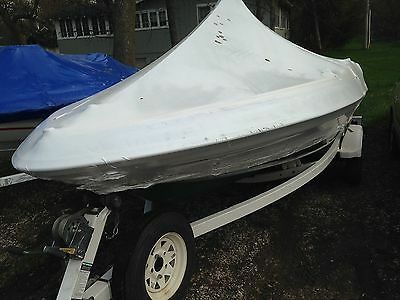 1998 Sea Rayder F16XR Jet boat 175hp V6. new upholstery pars or repare We bought this boat a 2 years ago. We have cleaned and maintained it! 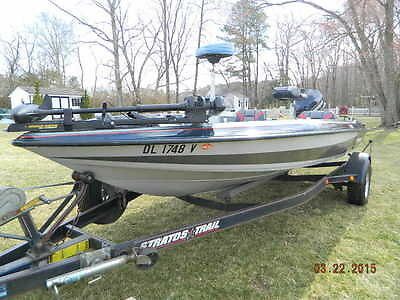 The boat has been under shrink rap kept the winter time. Boat tops out at ~45mph. Pretty smooth on the water for such a small boat. I've replaced: - bimini top - mooring cover - new upholstery - Trailer jack - I removed the speakers/radio because they didn't work and the spot works as a great glove box. jet/impeller checked & good, engine needs repare, working but make inner nuking noise. Comes with: - Battery - Service-repair manual on DVD - bimini top - Life jackets (adult and child) - Night time lights Fits in most garages easily and can be pulled by any cars Local pickup ONLY. NO SHIPPING :) Ready for your inspection here in Round Lake Beach Beach IL. Cash or Certified Check only. Call today 847-791-0222 Free local pick-up from 60073 Pictures Are Of The Actual Item. Please Refer To The Photos For More Details. Please see the pictures; they describe this far better than we can with words. Thanks for Looking! Powered by eBay Turbo Lister The free listing tool. List your items fast and easy and manage your active items. 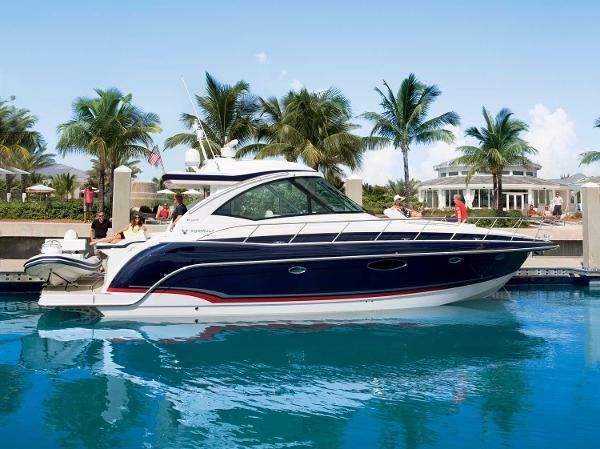 2013 Cruisers Yachts 45 Cantius With the smooth integration of lavish indoor spaces and the great outdoors, the remarkable Cruisers Yachts 45 Cantius offers a seamless flow that feels refreshingly unlike any other on-water lifestyle. With spacious entertaining areas, a full glass enclosure and unprecedented sight lines, the 45 Cantius expands your experience beyond the horizon. Volvo Penta IPS 600 w/ 435HP x 2 Diesel-POD drives with joystick Increased (+) maneuverability, speed, acceleration Reduced (-) fuel consumption, emissions / nautical mile Dual RayMarine touch screen E127 glass w/ radar, GPS, autopilot Forward & aft cameras with night vision linked to RayMarine screens @ helm KVH TracVision satellite 3 flat screen TV's with individual DVD players 13 kW generator, 3 separate AC/heating systems HUGE! hydraulic swim platform with SEA DOO Spark included Outdoor grill, fridge, and lounge seating with storage Large telescoping cockpit sunshade, sits flush in hard top Aft seating lays flat into sun chaise lounge Sun pad on the bow with drink holders! Latte exterior upholstery and flexiteek cockpit flooring Shiitake leather couches throughout yacht Walnut hardwood cabinetry with solid surface countertops Washer/dryer combo Sunroof in salon with 360°views Underwater lighting, LED lights around all speakers 20 speaker stereo system - Wet Sound speakers with 5 amplifiers Fusion Blue Tooth cockpit stereo with transom remote This boat is kept in meticulous condition. Hand washed several times per week and always freshly waxed. Boat is kept on Greers Ferry Lake (one of the cleanest bodies of water in the country) THIS IS A MUST SEE! please do not delay to call/email/stop by today! Greg Ray -- Plano Marine Yacht Sales -- GregRay@PlanoMarine.Com Cell -- 214.354.0934 -- Office -- 972.423.3134x250 -- Plano Marine -- 1105 K AVE -- Plano, TX -- 75074 - Meticulously Maintained Yacht!